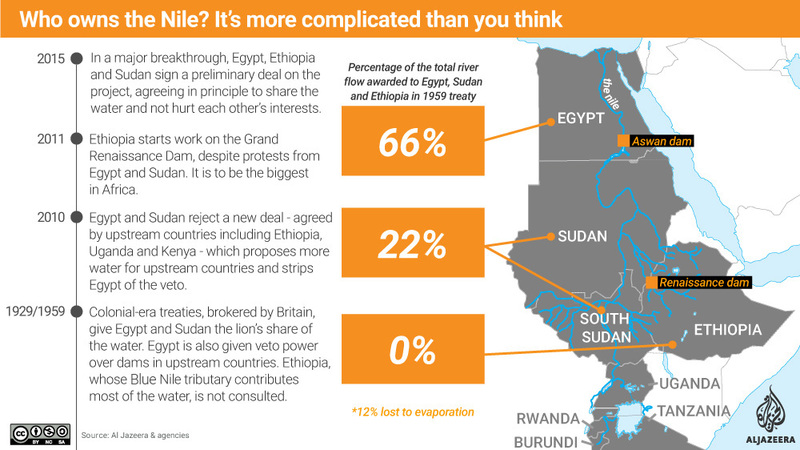 A look at the ongoing dispute over the Grand Ethiopian Renaissance Dam and its impact on the world's longest river. Water ministers from Egypt, Sudan and Ethiopia have gathered last week to discuss how Africa's largest hydroelectric dam will affect water distribution and access to the Nile. The Grand Ethiopian Renaissance Dam (GERD) is 60 percent complete and has yet to go into operation. The $4.8bn megaproject near the Sudanese border was launched in April 2011. Water rights and the utilisation of water from the Nile for power generation still remain highly contentious issues. And there are concerns about GERD's impact on the river and downstream nations. Nearly a quarter of a billion people rely on the Nile's waters. Its basin covers eleven countries: Tanzania and Uganda, Rwanda, Burundi, the Democratic Republic of Congo, Kenya, Ethiopia, Eritrea, South Sudan, Sudan and Egypt. Egypt and Sudan claim exclusive rights to its use and object to anything that might affect the river. This is based on colonial-era treaties of 1929 and 1959 that gave Egypt and Sudan the lion's share of the Nile's water. Egypt was also given veto power over dams in upstream countries. Most of Egypt's Nile water originates in Ethiopia from the Blue Nile, and the nation hopes for the Renaissance dam to help boost its economy. In a major breakthrough, the three countries signed a cooperation deal on the project in 2015. But Egypt still fears that the dam will cut into its water supply. "The building of a great dam is bound to have impacts, both locally and throughout the river system, it's all one joined-up system. However, the way that it's done, the way that it's built, the way that it's filled, and the way that it's managed can massively reduce those impacts," Colin Thorne, professor and chair of Physical Geography at the UK-based Nottingham University, tells Al Jazeera. He believes that "if the addition of another dam to a river is done in a coordinated fashion, with the existing dams and water resource developments, then actually the addition of a dam can be beneficial. So it's all in the way that you do it and in the way that you operate the dam afterwards." Asked about Egypt's concerns regarding the dam and its impact, Thorne says, "I think any country in Egypt's position would have concerns about developments of a major water resource upstream.... they don't have control over what happens upstream of them, so they are justified to be nervous, but they must enter into full dialogue with Sudan, with Ethiopia, indeed with the other countries in the Nile basin. That's the only way that the Nile can be managed in a coordinated fashion to the benefit of all the nations." According to him, there's always a possibility of a regional resource conflict, but "the Nil is a fantastic water resource. It's been exploited for not just centuries but millennia, and that's going to go on in the future at a time of increased water stress, because of climate change. And if the nations and the engineers and the technical experts work together, then fears, although understandable, will be unnecessary." Who owns the Nile? In 2015, Egypt, Ethiopia and Sudan agreed to share the water of the Nile. But why the discord in the first place?